Not long ago I made some 3D strawberry cookies and they were so much fun that I thought I would revisit the 3D cookie with a back-to-school version. An apple for the teacher is a time-honored tradition, so naturally I decided that sending 3D sugar cookie apples would be the way to go. Initially, I decided to manipulate the dough into apple shapes and then bake them directly on baking sheets, as I did for the strawberries, yet even though I froze the cookies before baking them, this time they did not hold their shape. 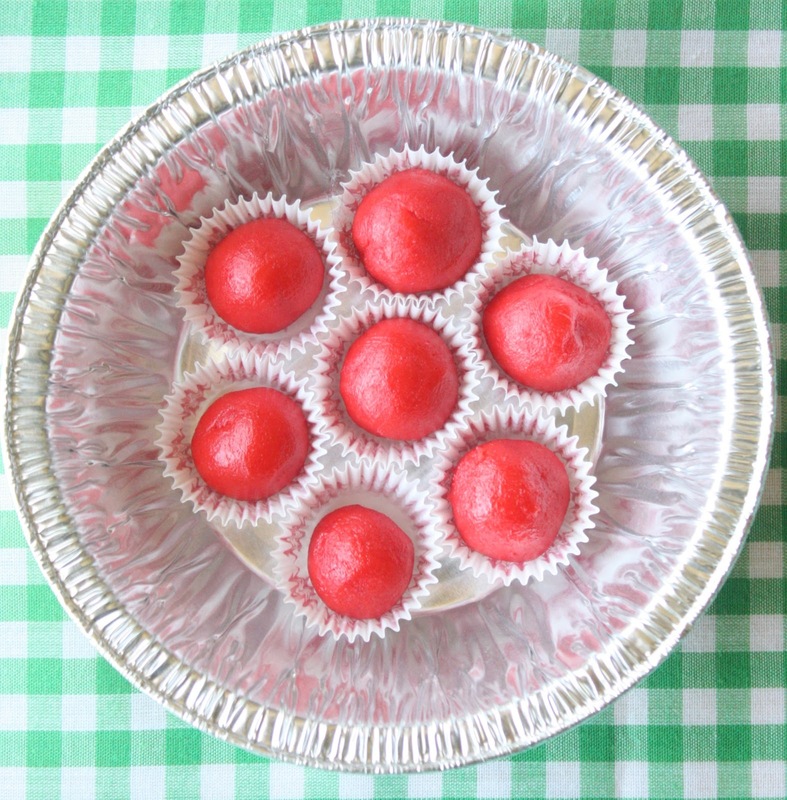 Enter the mini muffin pan to the rescue (lined with mini cupcake liners)! I made some sugar cookie dough, colored the majority of it with red food coloring (AmeriColor Super Red) and the other portion with green food coloring (AmeriColor Leaf green). 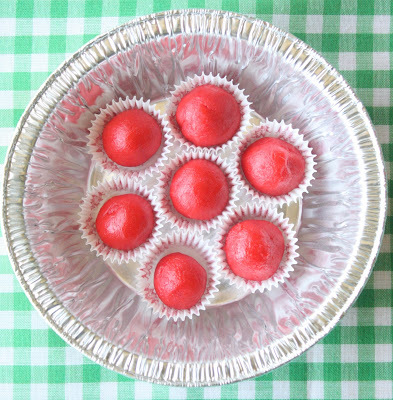 The red dough was rolled into balls, placed into the muffin pan and baked for about 18 minutes at 350 degrees. The tiny leaves were hand shaped and baked on a cookie sheet for about 10 minutes at 350 degrees. I broke off pieces of pretzel sticks for the stems and helped secure the stems and leaves with a bit of royal icing, dyed red. When my mini muffin pan was in the oven I remembered that I had bought some micro mini muffin liners at Ikea two years ago. 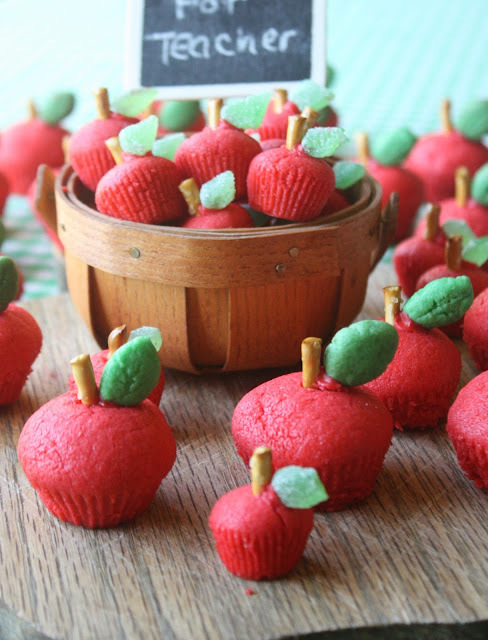 I knew they would assist in making adorable tiny apple cookies! They are about one third the size of the mini muffin apples. I set them in a disposable aluminum pie pan (pot pie size) to bake (350 degrees for about 15 minutes). Aren't they cute? They may look like muffins, but once you bite into one, their consistency and taste gives away their true, sugar cookie identity:) These tiny leaves were made by cutting out leaf shapes from spearmint jelly leaf candies that I had in my pantry. The apple stems were made with pretzel sticks (broken to fit) and inserted gently into the fresh baked cookie before it firmed up. Once the royal icing has dried, the leaves stay on firmly and the apple cookies can be placed in a basket, jar, or cellophane bag tied with a ribbon. The cookies above were the apples baked in the mini muffin pan. I think it would be such a cute idea to place these in a jar, apply a label with chalk paint and have your child put their teacher's name on it, or draw a picture. I looked at all the craft stores around here for mini apple baskets, to no avail, but for my display I used this little Peterboro basket, which I bought years ago. It is only 2-inches deep and 3.5-inches wide. No matter how you package these little cuties, they are sure to garner high marks from any teacher! 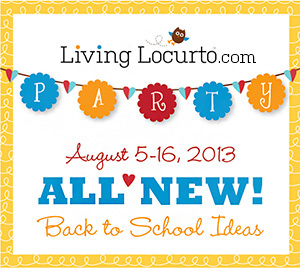 This post is part of a Back-to-School party being thrown by my friend, Amy of Living Locurto! Be sure to visit her blog for some fun projects, all relating to school! Thanks Amy, for organizing such a fun event! These are just BEAUTIFUL! What a cute idea!!! The little apples turned out so cute!!! These are so adorable and such a cute treat for a teacher. 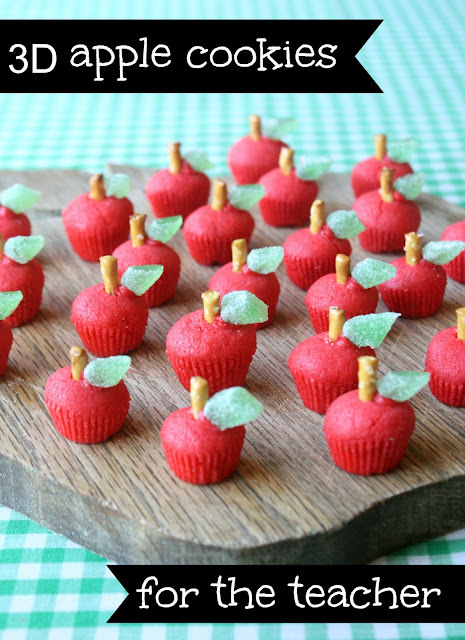 Sue, these are the most adorable, cutest little apple cookies ever! They look so so adorable, Sue. So cute! What teacher wouldn't love these?! Also, that basket is perfect for your apple bunch! Squealing at the cuteness here. Adorable little cookies and your photo presentation is delightful. So cute - who knew it was so easy?! Thanks for sharing! Oh, goodness, these are so cute! These are super cute! What a wonderful teacher gift! Oh my gosh, these are just absolutely adorable! Sue these are so cute--and I even think I could make them! I don't really love cake balls but a sugar cookie ball is a whole different game. Love these! wow so stinkin adorable! they are so mini, love!! Love these and I'm pretty sure I'm going to try them for back to school as a teacher gift ... maybe some for the office as well if all goes well. Just wondering if anyone has filled sugar cookies before? Thought it would taste great to fill these with some caramel. Any thoughts on whether that would work? How did I miss these? They look so perfect... and yet so simple. That's the best part. Bravo! I've had these in my favorites for a while meaning to make them, and finally made them for my daughter's teachers for the end-of-year present. The linked sugar cookie recipe was great because it was a big enough batch I only had to make one batch for 4 teachers. I am NOT a baker, I am NOT crafty and I generally am terrible at this sort of thing. I pretty much had my camera out for my "NAILED IT" post. But these were actually very easy to make!! They were yummy, looked totally cute and were a big hit - thanks so much!! (For my leaves, I found little molds at the bulk barn and made leaves from melted molding candy. I didn't attach the leaves to all of them). This is so creative! Just wondering if these can be made in advance and frozen..?